Image caption Will Marlon Bundo's new life leave Mike Pence hopping mad? "My name is Marlon, but my family calls me BOTUS. It's short for Bunny of the United States." These are the words of Marlon Bundo, a pet rabbit belonging to Vice-President Mike Pence - or at least, these are his words according to a children's book presented by Last Week Tonight presenter John Oliver in a bid to rival Pence's own book about the bunny. 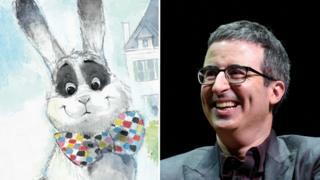 Within 24 hours of release, Oliver's book, penned by Last Week Tonight writer Jill Twiss, has topped the best-selling books list on Amazon. The original book, Marlon Bundo's A Day in the Life of the Vice President, was written by Mr Pence's daughter Charlotte and illustrated by his wife Karen. It tells the story of the VP through the eyes of his family's rabbit. Oliver's rival book, A Day In The Life of Marlon Bundo, illustrated by E.G. Keller, tells the story of the same pet as he falls in love with and marries another male rabbit - taking aim at Pence's history with LGBT rights. When announcing the book launch on his show, John Oliver said there were "a few small differences" between his book and Pence's. "Our rabbit has a bow tie," said Oliver. "Also, our story is about Marlon Bundo falling in love with another boy rabbit." Oliver said profits from the book would be donated to the Trevor Foundation, which aims to prevent suicide of LGBT young people, and AIDS United, which has a mission to end AIDS in the United States. Oliver's parody book has been praised online, with one person calling it "an act of subversive brilliance". Some people instead praised the audio book, which features Big Bang Theory's Jim Parsons as Marlon Bundo, with Modern Family's Jesse Tyler Ferguson voicing love interest Wesley. Parsons married his boyfriend in 2017 while Ferguson, who married his boyfriend in 2013, has also declared his support for Modern Family featuring a transgender child. Both Parsons and Ferguson have posted on Instagram how "honoured" they are to take part in the audio book. The discussion continued on Reddit's subsection dedicated to politics, where John Oliver was labelled "a real life superhero" and praised for highlighting charities which were "doing great work". But one person called Oliver's book "petty" and "mind-numbingly stupid," among comments - mostly urging people to buy the unofficial parody - posted on the official Marlon Bundo Instagram account. "Oliver's response book seeks to tear down Pence through his wife," read another criticism.